Peanut butter and chocolate is a winning combination no matter how you look at it. If it weren’t, there wouldn’t be nearly so many chocolate and peanut butter confections in the candy aisle at the store. But candy isn’t the only place where you can pair these two flavors. I matched them up in this muffin recipe, adding chocolate chips to a peanut buttery muffin for a rather indulgent breakfast or brunch snack. I chose to use milk chocolate chips, rather than the semisweet or dark chocolate I usually use. I think that milk chocolate and peanut butter work very well together (possibly because milk and peanut butter really go hand-in-hand), and the milk chocolate chips add an extra bit of sweetness to the not-too-sweet muffin base. You should certainly free to substitute a darker chocolate chip if that is your preference, and if you want to make this extra indulgent (or want to really impress at a bake sale), use chopped up peanut butter cup-type candies, like Reese’s. I will also note that I used a natural peanut butter that had minimal salt and sugar added into it. The recipe should work out just as well using a more commercial peanut butter, but the flavor will be slightly different since they tend to have more sugar and salt in those butters. Feel free to use chunky peanut butter or smooth, depending on what you have on hand at home and whether you want any extra bits of nut in your muffins. I have come to expect that peanut butter cakes/muffins/cupcakes, unfortunately, sometimes turn out to be a bit dry and much denser than their non-peanut butter counterparts. Happily, that was not the case with these muffins. They were surprisinly moist and had a relatively light crumb, giving them an almost cake-like texture. But since they are muffins and not cupcakes, they are still sturdy enough to hold up to a spread of peanut butter or cream cheese, if you want to top your muffin off before you eat it. Divide batter intoÂ your paper-lined muffin tin. Each cup should be filled to the top, not just half way up, to ensure you get a nice dome on the muffin. Those are beautiful. I was suprised when you mentioned you used milk chocolate chips, but I suppose that makes sense with a not-too-sweet base. I made some muffins today that were a complete failure. I’m still not sure what happened, but they spread out instead of doming upwards. That is, the crowns all spread out and stuck together. These are spectacular Nicole! I love to bake muffins on the weekend and I think your recipe is going to the top of the list. I’m sure my boyfriend will be very grateful for your creativity. Anna – I think that happens every once in a while to everyone. I say just eat the crispy tops and try again! Hi. I just wanted to say that I have spent literally hours exploring your blog today. I found it through a link on another blog and had bookmarked it to explore. I will definitely be trying this recipe as my kids love peanut butter. Like Lisa ^^^ I too found your blog through several baking links and have just finished reading through all 133 pages! I just want to say that I absolutely love your mix of topics…recipes, baking gadgets, latest crazy food related items and a round up of other blog recipes. And I also love the pictures, I find I can’t invest in a recipe unless I see a picture, both to attempt to re-create it and to drool over. I have bookmarked so many of your recipes I’m going to have to start a file all of its own! I have tried the nutella scrolls and intend to make bills coconut bread for a bake sale we’re having in work. I also have to share the love of bill granger, his series that he had on the BBC on Saturday mornings was my only reason to get up on a Saturday! I love his relaxed way of cooking. Okay, I’ve rambled on too much, I’ll go now but thanks again for a fantastic blog and keep it coming, I look forward to every post! I do love your blog too! Most everything I have made from your archives has been met with rave reviews from friends. These muffins look delicious, and I have all the ingredients waiting at home… yay! There is nothing better than chocolate and peanut butter!! I checked your blog this morning as I do almost daily and I was hit with a craving for your peanut butter and choc chip muffins. What do you know, I had a bit over an hour before I had to go to class so I baked up a batch of these. They are FANTASTIC! I subbed in margarine for the butter, used commercial PB and semi-sweet chocolate chips and I couldn’t be happier with the results. Thanks for all the wonderful recipes you post and the interesting gadgets you write about. Peanut butter & chocolate…one of my favorite combinations…these look great! 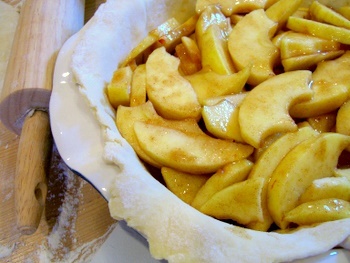 Hi Nicole, yet another fan here wanting to pass on a multitude of thanks for all your lovely recipes and inspiration. I came across your blog around twelve months back (having never baked before), now I can’t stop!!! (I’ll end up looking like a piece of cake if I eat anymore!!!) Loving the peanut butter/choc chip muffins too. I made them last night, the light moist texture is superb and certainly superior to others I’ve tried. Do you think it would be possible to increase the peanut butter and decrease the butter for a more pronounced flavour without sacrificing the sponge? God I could talk all night here! Anyway once again, thank you, thank you, thank you!!! I just made these, and they are still slightly warm. They turned out great, even though my tops are a little bigger and un-even. There is one on this blog. I just made these, and they are really good. I did make a couple of changes: I cut down the amount of brown sugar (just a tad), and I used semi-sweet chocolate chips. Thanks so much for the recipe! I LOVE your site! i just made these as well, and it turned out really good! had to substitute brown sugar with half white since i ran out, but they were still lovely. thanks! I just made these, and they were kind of disappointing. They didn’t really taste like peanut butter and are a little tasteless. Unfortunately I have to agree with the last comment. Made those muffins today and alas! They really are tasteless. Disappointed. Have to agree with the previous two comments, just made these muffins and I’m very disappointed. They look nice but upon tasting everything goes downhill, they really don’t taste like peanut butter and have a dry and weird texture. The only thing that sort of saves these muffins is the chocolate chips. Admittedly, as I started to make this recipe I found 2 things unusual. Mixing milk with peanut butter& butter and mixing the brown sugar with the flour. The resulting muffin mixture very much resembled thick cement but was by no means pourable. I used Smuckers Natural Creamy Peanut Butter and added to the recipe a handful of Reese Peanut Butter Chips for good peanutty measure. Mmmmmm they turned out GOOD! Dense but cakey & moist, with a yummy peanut flavour (I attribute very much to the natural peanut butter & the PB chips!) I’d make these again….I’m bringing this batch to work with me tomorrow. I was trying to be smart by telling the reader to visit my site for the rest of the story but I was advised that was not part of their game plan. I made these. They were OK. I made them again, omitted the butter and added applesauce and flax meal. They were SO much better! Moist, and a bit more flavorful. Still very healthy tasting, but that’s ok with me. I posted the new recipe on my blog. GOOD! 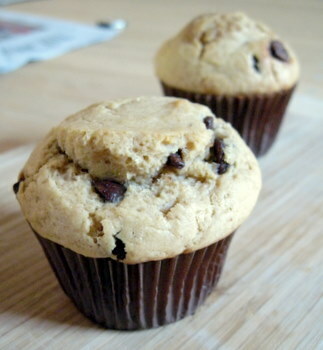 Dense but cakey & moist, with a yummy peanut flavour (I attribute very much to the natural peanut butter & the PB chips!) Iâ€™d make these againâ€¦.Iâ€™m bringing this batch to work with me tomorrow. I was excited about this recipe but it had absolutely no flavor!!! I am not sure if I did something wrong but it had no taste and I will not make them again. I used Skippy’s creamy peanut butter (maybe I should have used natural?) , dark brown sugar because that was what I had in the cupboard (instead of just brown sugar). My husband said he couldn’t taste the peanut butter and that it had no taste whatsoever (except for the chocolate chips). Too bad. It looked pretty. I made these today and they came out great! They were just the right amount of peanut butter and chocolate ratio. I used a bit more than 1/2 c. peanut butter (commercial kind) probably 2/3 c. Next time I will try the milk chocolate chips instead of semisweet. I think the milk chocolate chips will compliment the pb better. I can’t wait to share these muffins! I just made these, and they are delicious!! I did make a few changes though- I’m a big chocolate fan, so I put in two cups of flour and a quarter of a cup of cocoa, and I used dark chocolate chips. I just used normal crunchy peanut butter from the supermarket, and they taste heaps peanut buttery! Maybe because I put in less butter and more peanut butter. Wow! These were great! I had never made muffins before and wanted to try and do it so I went with this recipe. It was easy and the muffins turned out marvelous. I took them to work and everyone asked for the recipe. A big hit! I really think the natural peanut butter and the Milk chocolate chips made the difference for us. Thanks again! I made this today. Instead of using milk choco chips, I used white choco chips. I’m not a peanut butter lover but I enjoyed eating this muffin. It was not too peanut butter-y and not too sweet.